I'm Kris. I'm 28 years old. I love reading, writing, scrap booking, and all sorts of other craftiness. 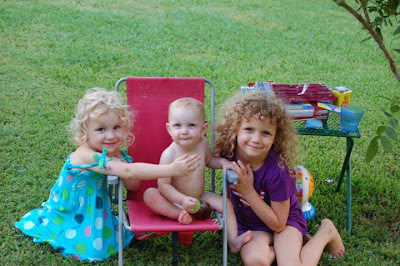 Mama to three beautiful but rambunctious daughters. Yes -- that's right. 3 GIRLS. Married to a good Husband RJ for 7 years. Our oldest is Caity! She is 6 years old. She was diagnosed a few years ago with some Urology issues, so we go to Arkansas Children's Hospital quite frequently for checkups. She starts 1st grade this year. She's very sweet, good natured, hilarious. Our middle daughter, Izzie, aka TROUBLE is 3 years old. She is the mischief maker, the one constantly into something. But she's also got a killer smile and a friendly disposition most days. Izzie has epilepsy, though we don't have a concrete diagnosis on it yet. Our third, and final, daughter is Calleigh. She is 11 months old. She looks like her mama. She is a doll baby. Really a total sweetheart. She is not a big whiner or cry baby. She's generally content to just be. Unless of course she gets something taken out of her mouth, then she's mad that she can't eat whatever it is she's found on the floor. We bought our own home in December of 2008 and love it! Still working on making it ours through remodeling., which is a job in itself. To complete our family, we have 3 cats, Athena, Sadie, and Shadow and 1 dog, an Alaskan malamute, Akira. I'm Kris, a 30-something year old mom of three girls. I'm a reader. A writer. A crafter. Caitlyn -- 9 years old. Trouble! Smart, sweet, and stronger than most kids her age. She has been through so much, and yet she's so HAPPY and easy going. Isabella -- 6 years old. The middle child. Trouble - maker galore! This one gives me a run for my money on an hourly basis. Calleigh -- The Baby. She's 4! She is definitely her own self (except when she has Cait mannerisms). She's tiny but fierce.